Images are supposed to illuminate meaning about time. I am interested in how we respond to the moments that we are unsure of. I explore personal history by creating ambiguous narratives that balance photographic sources with abstraction. 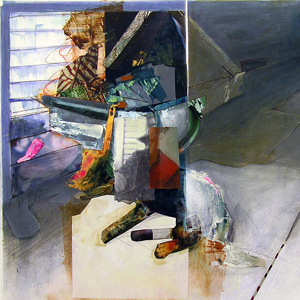 Using mixed media and collage painting, my work unfolds parts of a story in a fragmented way. Misappropriating and transforming memory to create a fictitious embodiment is what propels the work. I use collage as a process of collection and isolation to explore time though enigmatic plots. I mix curious figures, machine like inventions, cutout forms and abstracted objects with oil, spray paint, ink, plastic, and paper. Using a process of erasure, re-creation, and dissection, I force the elements to cohabit the same loosely defined space and create logic of their own. Each layer struggles to clarify or obliterate the previous. I look for moments that balance graphic sharp outlines, and the fluidity and mark making capabilities of paint. Only odd moments prevent the entire scene from slipping into abstraction. The viewer is caught in-between the visual transformation occurring on the surface of the paintings and imagery that alludes to moments of waiting, being lost or stranded. The isolation of forms in space mirrors the isolation of the viewer. Sorting through this tension and narrative, viewers try to develop plot and meaning using the hints of what might be beyond the picture plane. Ultimately, the viewers are searching for an undisclosed secret as means to access the dense and intimate moments depicted. The collective imagery melds into jettisoned memory, imagination, and misinformation that have collected over time.